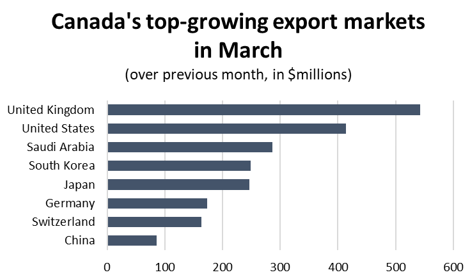 For the first time in four months, Canadian exporters posted solid growth in March, with total foreign sales increasing by 3.7 per cent over February to reach $47.6 billion. Although that increase brought exports to their highest level since last May, it was eclipsed by a widespread surge in imports, causing Canada’s trade deficit to widen to a new all-time monthly high of just over $4.1 billion. While exports were higher in March, growth remains flat on a year-over-year basis. A year ago, Canada was enjoying an price-driven recovery in energy exports that lifted year-over-year growth into the double digits. 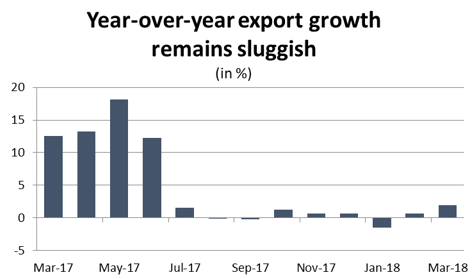 By comparison, exports in March 2018 were just 1.9 per cent higher than they were 12 months earlier. 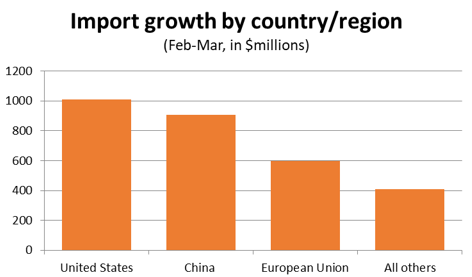 For their part, imports hit a new record high in March, as Canadians bought more goods from the US, China and the EU. Total imports rose by 6.0 per cent for the month, reaching $51.7 billion and eclipsing the previous record set in December. The increases in both imports and exports were driven by higher sales volumes. 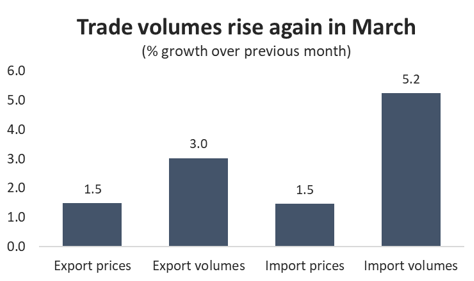 On the export side, shipment volumes rose by 3.0 per cent compared to February, bolstered by a 1.5 per cent increase in the prices that exporters received for their goods. It was a similar story on the import side. While import prices were also 1.5 per cent higher, the volume of goods coming into Canada rose by 5.2 per cent in March. 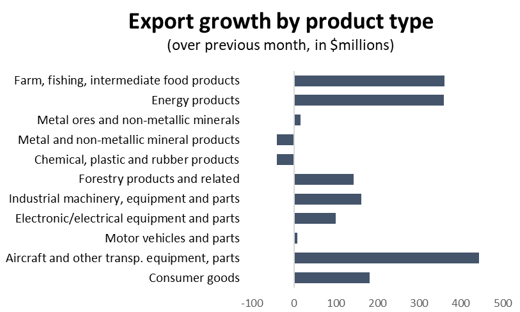 Turning to export products, growth was relatively widespread in March, with nine of the 11 broad product categories posting gains. Leading the way was the aerospace sector, where the delivery of four Bombardier CSeries jets caused exports to jump by $444 million – an increase of 24 per cent compared to February. There were also solid gains in agricultural and intermediate food products, as well as energy products, both of which rebounded from sharp declines in February. Led by higher wheat shipments, exports of agriculture and intermediate food products were up 14.7 per cent ($361 million) in March. Meanwhile, energy exports were up 4.2 per cent ($360 million) on the strength of higher crude oil deliveries. On the negative side, lower shipments of nickel, copper and aluminum alloys drove exports of metal and mineral products down 0.8 per cent in March. Similarly, a decline in non-fuel petroleum products contributed to a drop in exports of chemical products. 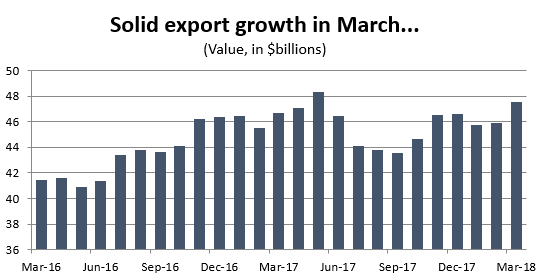 The only other notable weak spot for exports in March was the auto sector, where exports were effectively unchanged compared to February. Motor vehicles and parts exports have been flat since November and remain more than 12 per cent below their recent peak last May. Export growth was also relatively widespread by destination. By far the most notable increase in March was a spike in sales to the United Kingdom. Exports to that country jumped more than 47 per cent ($543 million), regaining most of the steep losses from the previous month. Exports to the United States were up 1.2 per cent ($414 million), while there were also notable trade gains in Saudi Arabia, South Korea, Japan and Germany. 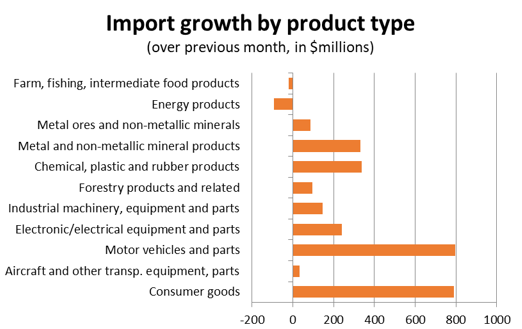 On the import side of the ledger, the 6.0 per cent spike in goods coming into Canada was distributed across a wide range of product types. Of the 11 broad product categories, nine were higher in March, with only energy and agriculture-related products down compared to February. On a dollar-value basis, the largest increases were in imports of motor vehicles and parts (up $795 million), and in consumer goods ($790 million). Interestingly the spike in imports cannot be pinned to a specific source. 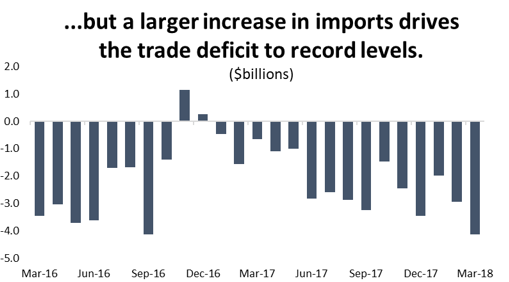 The largest increase came from the United States, where imports jumped by more than $1.0 billion in March (3.1 per cent). However, imports from China increased by almost the same amount ($906 million, or 26.5 per cent), while purchases of goods from the EU were nearly $600 million higher compared to February.